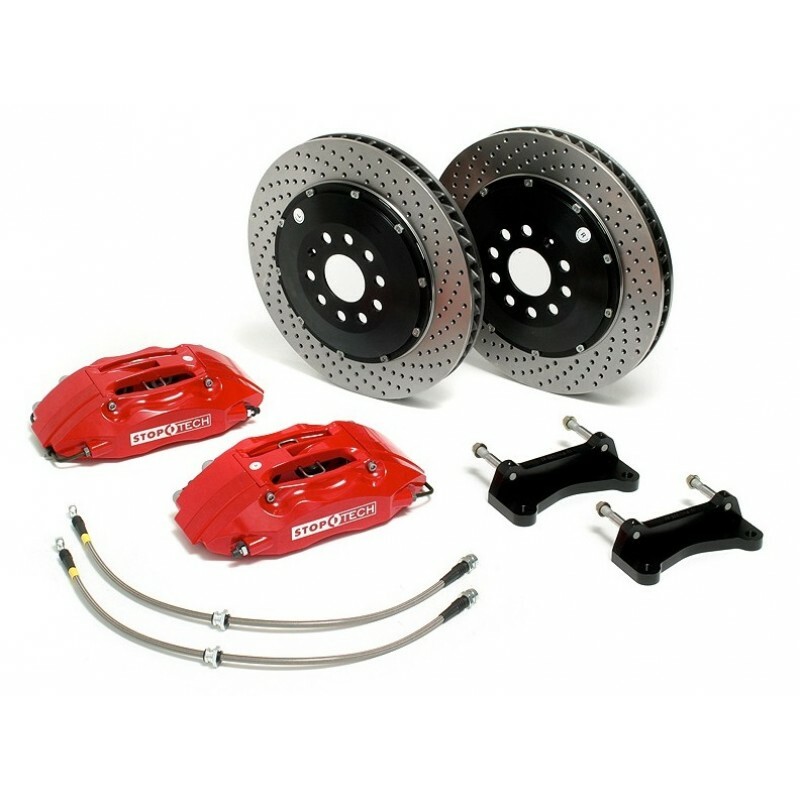 StopTech Big Brake Kits improve aesthetics and exceed stock brake performance in three areas. First, larger rotors increase heat capacity. Second, improved brake cooling dissipates absorbed heat. Third, stiffer calipers and stainless steel lines reduce system compliance. The key, however, is to increase heat capacity and reduce compliance without upsetting the stock front to rear brake torque ratio, also referred to as brake bias. Regardless of rotor diameter, brake pedal ratio, brake pad material, or number of pistons in your calipers, your maximum deceleration is limited every time by the tire to road interface. If the brake upgrade you select adds too much front brake torque (as many do), it will drastically shift the brake bias too far forward and reduce your car's ability to utilize the maximum traction of the tires at all four corners (even on ABS equipped cars), increasing stopping distances dramatically. In addition, too many pistons or pistons that are too large will make the brake pedal much more difficult to modulate, which limits a driver's control of brake input. StopTech Brake pads combine the benefits of premium street brake pads with aggressive friction formulas suitable for track day and autocross use. StopTech's ST-40 calipers are manufactured using a squeeze-forging process at Sanyco, a 34-year old company that is CNS, QS 9000, and ISO 9002 certified. Mitsubishi®, Volkswagen® and Toyota® are among their top customers. With squeeze forging, pressure is applied during cooling. This produces a beautifully finished, solid part, without porosity. StopTech does all finish machining (such as piston bores sized correctly for the application), assembly and test in California. Calipers that are cast without being squeeze forged can have major issues with porosity which can even cause calipers to leak. Dust boots are standard on StopTech calipers to keep the pistons clear of contamination and extend the service life of the calipers. Competitors calipers designed without dust boots require rebuilding every two years. Using finite element analysis (FEA) modeling software, StopTech has designed a bolt-in bridge strong enough to stop distortion without sacrificing cooling through the top of the caliper. The squeeze forged StopTech ST-40 caliper has the least flex of any tested aftermarket or OE caliper. The air channel in the bridge helps air flow through the retainer, resulting in better cooling. The chart below shows the results of testing 25 leading caliper models by the major caliper companies. Each caliper was subjected to the same pressures and deflection was measured with a dial caliper. 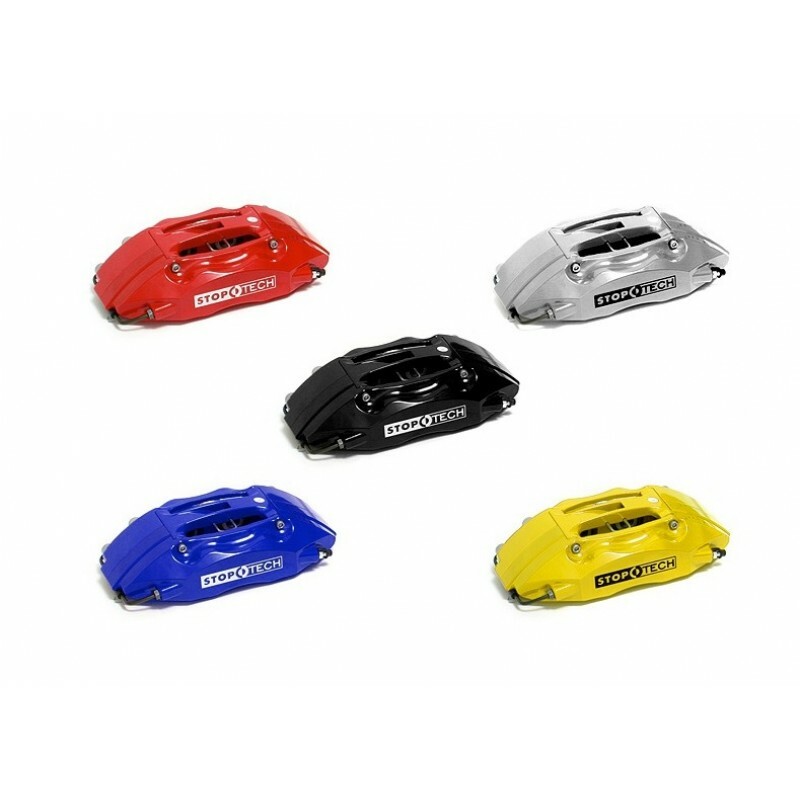 StopTech calipers were the stiffest caliper of the major brands tested. StopTech's racing AeroRotors® are cast at Pilenga S.p.A., the second largest rotor manufacturer in Europe. Pilenga is ISO9002 and Vision 2000 certified and has been casting brake rotors for over 50 years. StopTech developed a proprietary cast iron formula for the AeroRotors® after extensive testing to ensure high durability under extreme use. To test rotor durability, StopTech rented the California Speedway and ran a heavily weighted down car with StopTech rotors on one side and a competitor's rotors on the other. In this test, StopTech rotors were approximately twice as durable as the competitor's rotors. StopTech has had several sets of rotors run entire 24 hour races on winning cars. The ability to absorb and dissipate heat is essential to brake system performance. The patented StopTech AeroRotor® features uniquely designed curved vanes with innovations on leading and trailing edges to optimize airflow through the rotor. This improved directional design minimizes turbulence and flows more air than any rotor tested. 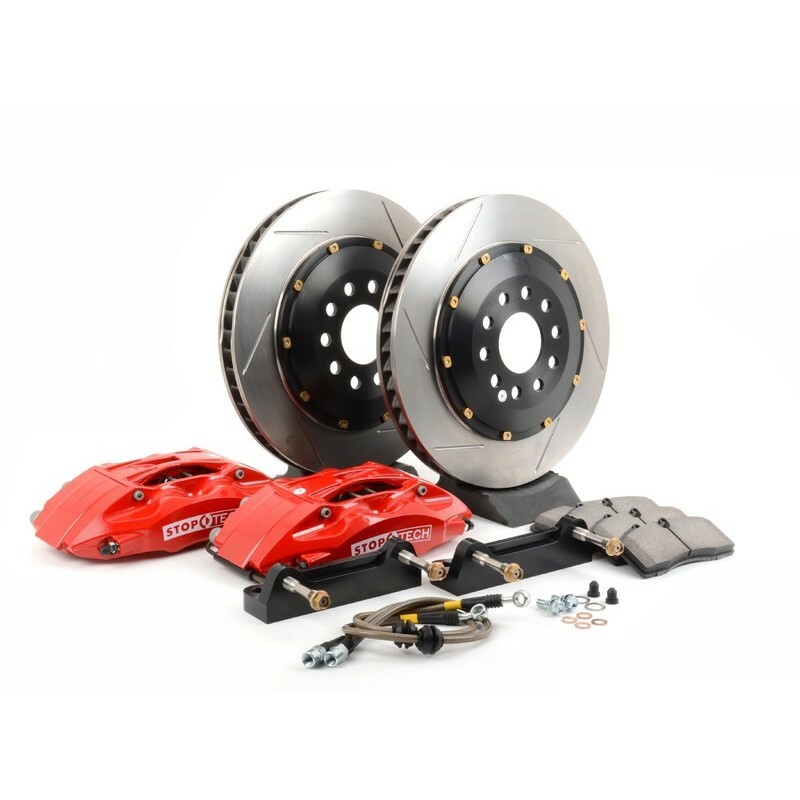 The result is up to 80% better airflow over original equipment rotors and 10-30% better airflow than directional vaned racing rotors currently available. The chart below shows that StopTech (top red line) has the highest induced airflow of any rotor tested. Leading aftermarket and original equipment rotors were tested for airflow from 30mph to 150mph. StopTech AeroRotors dramatically outperformed all other rotors, with improvements from an impressive 11% to a staggering 80% increase in airflow. The patent pending StopTech AeroHat™ has directional stand offs between the rotor and mounting bell (hat) that increase airflow to the outside faces of the rotor by 50-100% and improve entire brake system airflow by up to 4%. Outer rotor faces typically retain more heat than inner rotor faces which wears the outer pads faster. StopTech AeroHats™ increase airflow to reduce the temperature difference between the inside and outside faces of the rotor resulting in less distortion, even wear and improved heat dissapation compared to other fully floating designs. StopTech AeroHats and caliper brackets are machined from AeroSpace billet aluminum on the latest active tooling CNC machines at StopTech's California manufacturing facility. StopTech makes their own stainless steel brake lines in California from the highest quality parts available. StopTech brake lines consist of a Teflon® inner line that is covered with a layer of stainless steel woven braid. The Teflon® tube is very resistant to expansion under pressure and will not degrade from exposure to brake fluid. The stainless steel braid provides support for the Teflon and the weave is extremely durable against incidental impact and abrasion. Lines feature a clear abrasion-resistant cover for maximum protection against chaffing and particle intrusion. Every fully assembled StopTech Stainless Steel Brake Line is tested to a pressure of 4,500 PSI. StopTech is a DOT (U.S. Department of Transportation) registered supplier of brake lines. StopTech ST-40 Big Brake Kits include StopTech Street Performance brake pads which are suitable for both street and light track use. StopTech Street Performance Brake Pads feature low dust, high initial response for cold stops, quiet operation, even pad wear and consistent pedal feel and performance. For more aggressive track use or race use, it is very important to select pads appropriate to the type of driving. Slotted rotors are preferred over drilled due to their larger pad contact area and their resistance to cracking, crossdrilled rotors are available at extra cost for light duty or show usage. Zinc coated rotors are available for an additional cost. Zinc coating helps reduce surface rust on unswept portions of the rotor. Yellow, blue and gold painted calipers are available for an additional cost and typically add 1-3 weeks to order delivery times.